A nature reserve in Vietnam is being established to protect one of the world\'s rarest mammals, a conservation group said Thursday. 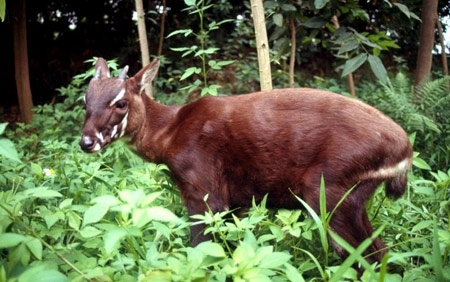 The Saola Nature Reserve in central Vietnam, which is being created in cooperation with the Quang Nam Provincial Forest Protection Department and the World Wide Fund for Nature (WWF), was set to protect the saola, a large, forest-dwelling bovine with long, straight horns that is thought to live only in the Annamite Mountains between Vietnam and Laos. The mammal, which first came to international attention in 1992, has become a symbol of biodiversity in the region. It is known to be shy and does not survive long in captivity. Its numbers have declined in recent years because of hunting and habitat loss, threatening the species with extinction. Estimates for those left in the wild vary from 70 to 1,000. There are likely fewer than 500, the WWF said. The creatures are currently classed in Vietnam\'s Red Book of endangered species and are listed as critically endangered by the International Union for Conservation of Nature and Natural Resources. Dang Dinh Nguyen, deputy director of the reserve, said he was confident the reserve would help save the saola. \'This not only helps animals escape extinction but also has long-term value for other biodiversity in the area,\' he said. Rated as one of the top 200 eco-ranges of global importance by the WWF, the Annamite Range is rich in biodiversity and home to many rare creatures, such as the recently discovered Annamite rabbit, the Indian bison and the Indochinese tiger. \'This new reserve will create a biodiversity corridor connecting the east of Vietnam to the west side of Xe Sap National Park in Laos,\' said Tran Minh Hien, the WWF\'s Vietnam country director.